Diggers Valley: 11 September 2010. The week beginning the 11th of September 2010. For my birthday Stephan decided he'd do a dinner party for ten. He did a splendid job, with two soups, Kumara and Pumpkin to start, then roast Pork with all the trimmings and vegetarian options for one guest as well. We finished with Crème Brûlée, and Lilo brought (at Stephan's request) the marvellous Chocolate Mousse she'd made for us when we dined with them several weeks ago. It was a delicious meal. Should anyone feel they were slighted in not receiving an invitation to this event, please be assured it was only because we don't have enough chairs and two people had to sit on a coffee table during dinner as it was! I think Stephan might like some more practice at this sort of catering though, so if you weren't here this time, feel free to indicate your willingness to attend another such feast. Any sort of occasion will do as an excuse. My very dear godfather, Hack, came out to visit just before lunch today. He said our lunch, composed of lovely dinner-party leftovers, compared very favourably with the restaurant meal he'd eaten last night! As we were finishing our desserts, Jill arrived and so lunch went on for a while longer. Late in the afternoon after Hack had left and Jill had made herself comfortable in a chair with a book, Stephan and I went out for a cow-seeking wander. 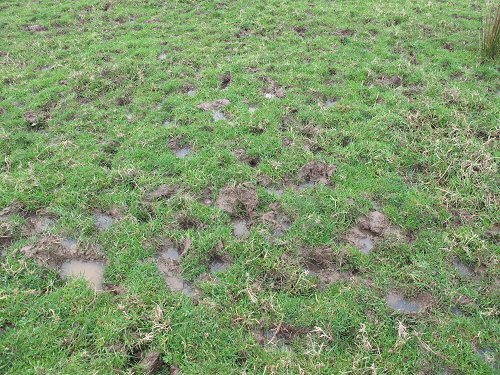 The ground conditions are now unpleasantly wet. 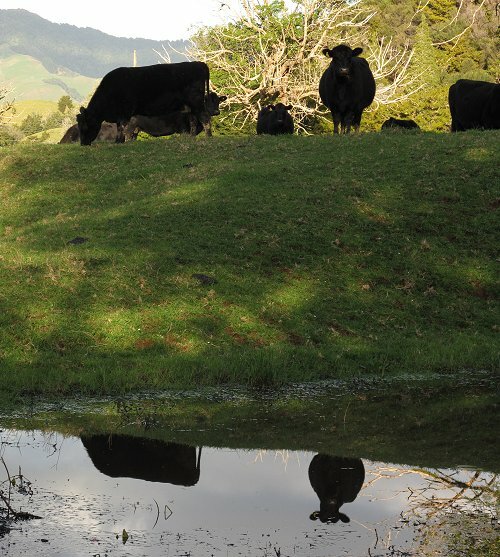 This is on the side of a hill in the Big Back paddock and if one is not careful, every step taken sends a jet of cold muddy water up one's legs. What a fabulous patch of Watercress! I don't remember seeing it here before. 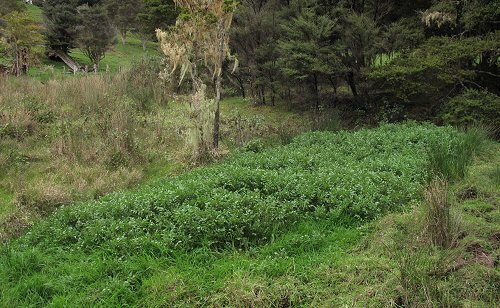 Watercress must not be something the cows like. Down on the flats it sometimes grows in one of the drains and we see it in the river crossings and even on the dry track from time to time. Stephan says he'll come back with a bag and pick some in the next couple of days, to try making some soup. The pink gunky appearance between this lamb's toes is what Scald looks like. 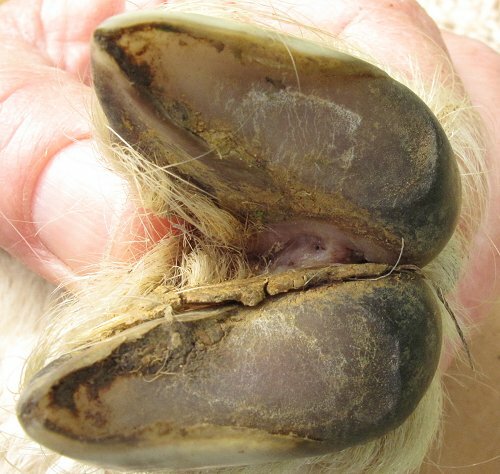 It's a fungal infection which makes sheep limp, but can be quite quickly and easily countered with a spray of iodine - usually needing another the following day, but sometimes once is enough. This is Lamb's lamb and while she continued to limp around for the next few hours, by the next day she was walking normally again and continues to do so. 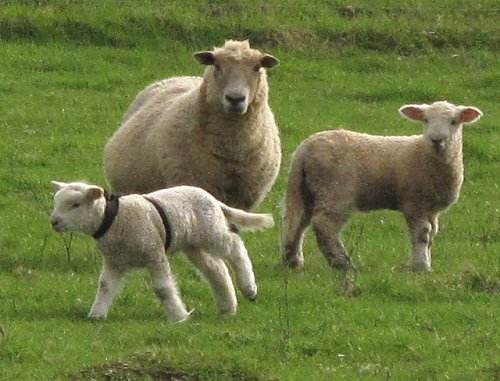 Lambs limping because of scald can look very much like they're suffering from the infection called Navel Ill, where bacteria enter their systems through the wet umbilical cord soon after birth, and cause inflammation and pain in their leg joints. Generally speaking, if a lamb is more than a couple of weeks old and it is limping, the cause is more likely to be scald than Navel ill. Navel ill requires antibiotic treatment to prevent abscesses forming in vital organs, but scald is far more easily dealt with. 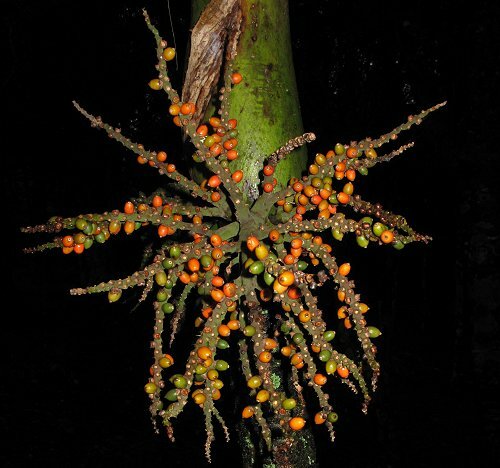 Nikau, Rhopalostylis sapida, is a beautiful plant at any stage of growth. This one is growing in the reserve on the hill over the road, and was pushed over by a falling branch some years ago (the first part of its trunk is horizontal, before it turns upward again). 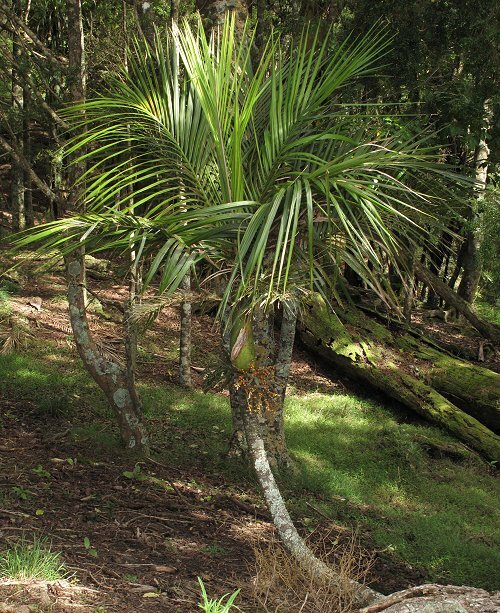 Where grazing animals are excluded from forest areas, Nikau often form a dense understory, which gradually rises as the palms grow their trunks. So she could see the other sheep, and have both shelter and sunshine, I tied the lamb under the Puriri tree for the day. 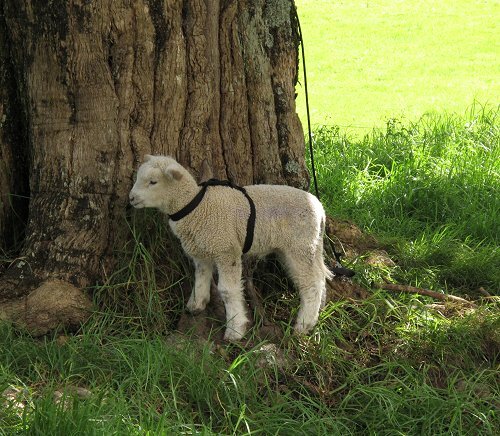 There's a little Totara tree growing out of a chink in the Puriri's trunk, which makes a useful tying point - high up or the lamb gets terribly tangled. I'd let her wander around the garden except that she might eat something she shouldn't (there are lots of daffodil plants around, for instance) or think she can walk off the edge to get to the paddock, and get caught in the electric wires on the front of the retaining wall on her way down. Later on I tied her harness around her to keep it out of the way and sent her out into the paddock with the other lamb after their feed. Again the others seemed a little unsure of her. 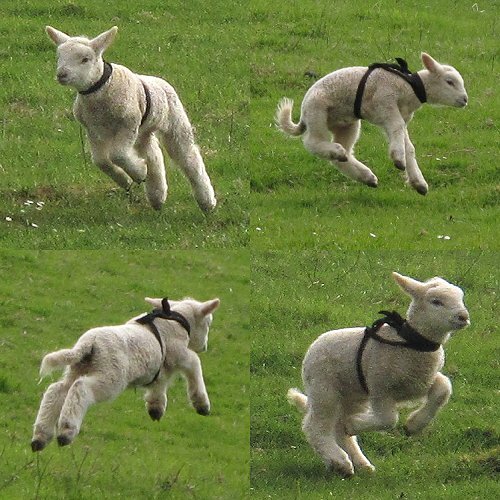 But she had a great time, throwing herself in the air and galloping up and down the paddock. I'm glad she's feeling so good. The cows moved themselves overnight through gates I'd left open for them, from the Big Back paddock to Mushroom 3. It's getting close to the time when I'll split off the first cows expected to calve from the others. I get a bit nervous about these last couple of weeks, having to remind myself to start my daily checks earlier than the start of calving. I've been lucky that the things which have gone wrong for calving cows before their due dates have generally happened in cows due later in the calving period, when I've already been watching them regularly. If a calf dies in late pregnancy for some reason and signs of attempted but unsuccessful labour are not noticed, it can have serious implications for the cow. This is the fruit cluster of the Nikau I photographed the other day, looking like the bejewelled underside of an oddly-placed octopus. Kukupa (or Kereru, the native wood-pigeon) eat a lot of these fruits. Here is something I ought to have noticed earlier and done more about. These are the twin rams born to the young ewe three and a half weeks ago. Because they fitted almost identically into bread bags that evening, I know they were about the same size when they were born. They're most definitely not now. Whenever I saw them feeding things looked as they should. It has only been in the last couple of days that I've noticed this one looking hunched and underfed and now so much smaller than his brother. I particularly noticed him when he was away from his mother and brother, very determinedly eating grass, something lambs of this age begin to do in an experimental way, but only if they're very hungry do they spend a lot of their time grazing. He has obviously not been getting adequate milk from his mother, although his twin looks fine. I watched her with the lambs very closely this afternoon and saw that whenever the small lamb attempted to feed, the ewe kicked her back leg and walked off. The larger lamb could feed for a little while with his mother's cooperation, but if both lambs were feeding, a sniff of the smaller one's rear would cause the ewe to walk away. We penned them this evening and I gave the hungry lamb a small bottle feed and then kept them penned for the night, so I could closely watch what was going on from the house. I don't understand why, but the young ewe is rejecting her small hungry lamb and must have been doing so for a while. We turned her over and checked her udder and milk, both of which appear fine. 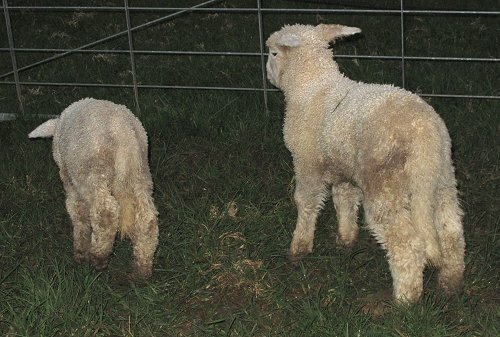 I experimented with smearing both lambs' rears with aniseed and later vanilla essence in the hope of confusing the ewe. I concluded that she's an unwilling feeder but the larger of the twins has enough determination to overcome her disinclination and to get enough milk to meet his needs. The smaller lamb though has probably gradually fallen behind in strength, and the weaker he became the less enthusiastically he would have tried to feed, so would gradually have had less and less milk. I don't want another lamb to feed, but he needs help. He is too young to leave to grass alone, and would slowly starve and then die. When I harbour expectations of the sheep flock being a useful part of the farm, I get very frustrated and impatient with them. However, if I were to think of them as providing opportunities for fulfilling all my unsatisfied childhood yearnings to raise baby animals, they're perfect!